Alex Wallace scored a double hat-trick as Castleford Tigers Women thrashed York City Knights 52-8 in their pre-season warm-up. 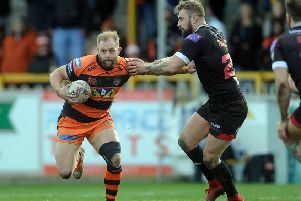 Six players made their debuts for Castleford yet Lindsay Anfield’s side were completely ruthless. Two of the debutants included new high profile signings Claire Garner and Rhiannion Marshall. Head coach Anfield said: “It was good to see a large majority of the squad get a run out. “We had a number of youngsters making their debuts, including Esme Reynolds, Annabelle Morley and Olivia Addis – they all played well considering it was their first game at open age. The match was in doubt with the main pitch declared unplayable due to the icy weather. But it was moved to a secondary pitch which was not ideal as it lacked goal posts. Nevertheless, Wallace open-ed the scoring with the visitors’ first set. Six minutes later, their lead was increased as Marshall crossed the whitewash for her first effort in Cas colours. The Tigresses continued their ruthlessness and got on the board once more as Roche powered through the centre. Five minutes later Wallace finished off a well worked set with a try down the right wing. The hosts struggled to contain the 2018 Challenge Cup finalists as Courtney Pointon soon made it 20-0 with a smart finish. Two more efforts from Wallace gave the visitors a 28-0 advantage at the break. The Knights hit back with two tries early in the second half. However, it did not take long for the Tigresses to recover from their half-time hangover as efforts from Tamzin Renouf and Kelsey Gentles quickly restored the 28-point lead. Roche then produced the try of the match as she raced 50 metres to score her second. A further try for Pointon and two more for Wallace sealed a comprehensive win.